1850’S MANSION EXUDING BOTH ELEGANCE AND DECADENCE OF OLD CREOLE LOUISIANA. 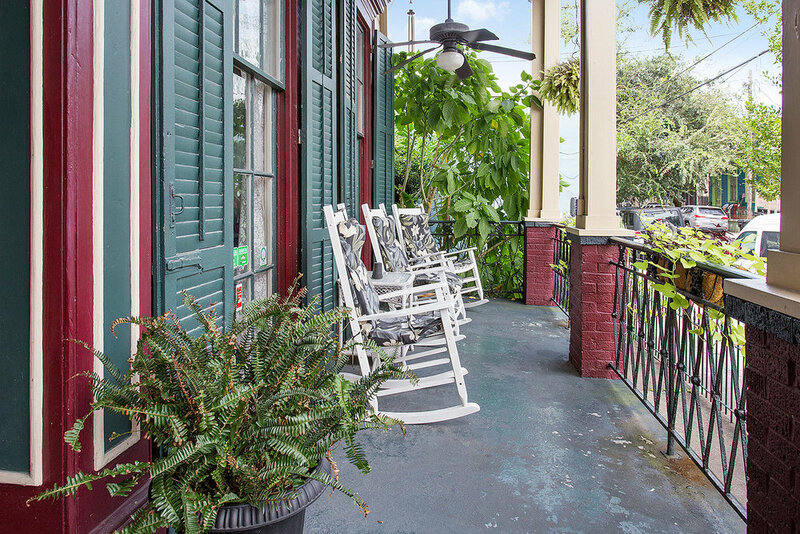 Get transported to antebellum New Orleans in the 150-year-old grand Greek revival mansion with stately columns and regal galleries in the award winning 9 suite bed and breakfast. Traveling with children? 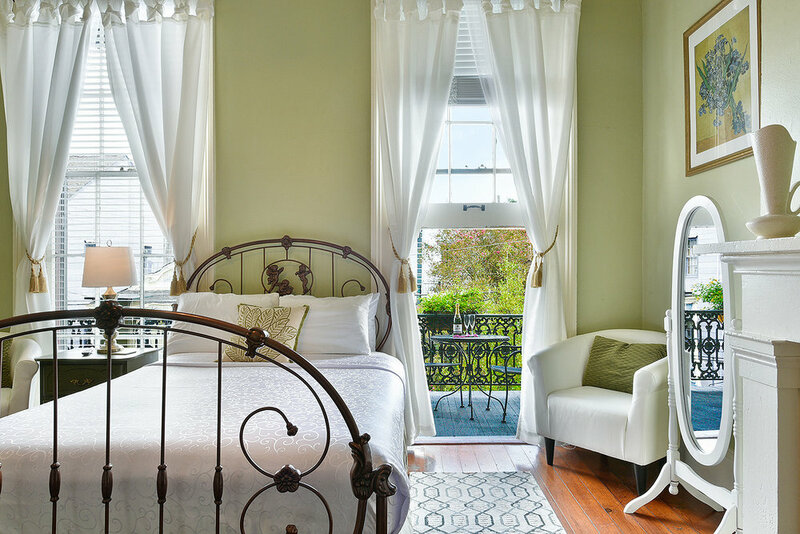 Our Marigny suite could be perfect for you, as it boasts two elegant four-post-raised beds, one sofa bed, and an antique dresser and armoire that offers more-than-ample clothing storage space for extended stays. The “Dauphine” Suite, located on the second floor, has a sofa bed, an ensuite shower, and a TV room separated from the bedroom. The “Chartres” loft is located upstairs in our rear quarters and has a full sized bed and an ensuite shower in the bathroom. The “Mandeville” loft is located on the first floor in our rear quarters and has a full sized bed and an ensuite shower in the bathroom. Inside, a quirky nineteenth-century charm you can find period furnishings mixed with more contemporary decorations and a good amount of frill. 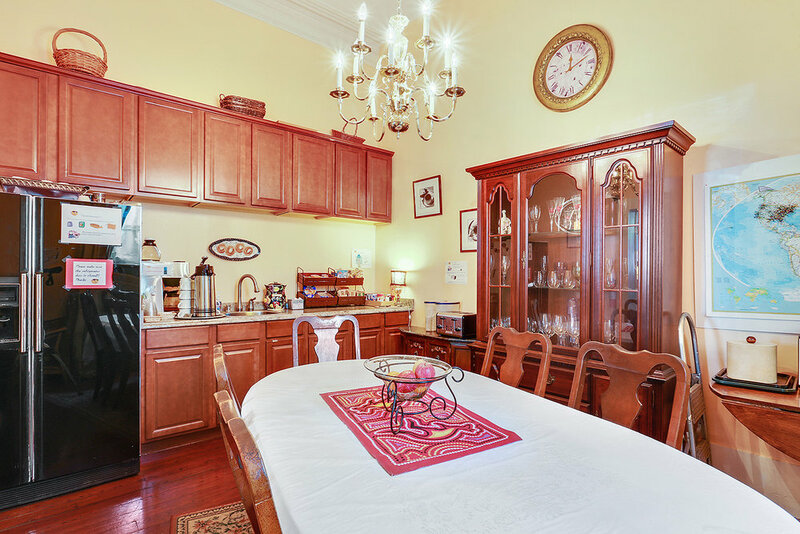 All guests are welcome to enjoy the self-serve breakfast and supplies in the kitchen throughout the day. Guests may also sip their morning café au lait or afternoon wine in the front porch or out in the jungle-like courtyard that also has a hot tub and outdoor shower (Bare as you dare!). During the day, the Marigny's funky vibe pervades. You can peruse antique shops and bookstores, opt for food from Creole to vegetarian or visit the gardens of Washington Square Park - all perfect places for meeting local artists, performers and neighborhood characters. At night it becomes home to some of the most revered live music venues in New Orleans, an eclectic gaggle of gourmand dining destinations, and a come-as-you-are vibe that’s as infectious as it is alluring, this is real deal New Orleans oozing with southern hospitality and the promise of a most epic night out.